Your reel is screaming as your line is peeling off it at a rapid pace. The fish takes a turn to the left and you must follow it. At that point, the real challenge occurs. There are nine other anglers to your left with their lines straight out. What do you do?? Well first off welcome to catching yellowtail on a party boat. Second, you head that way going over or under the other angler’s lines and rods as you chase your fish. This action has many names like the Chinese fire drill, Texas Two Step Shuffle or it sometimes is called something that I can’t print on these pages. Most anglers who take ½, ¾ day or full day trips on our local boats are pretty good at working in unison with the person who is hooked up. It just takes a little awareness and common courtesy. And usually the captain of the boat or a deckhand will be with you every step of the way with direction on what to do. 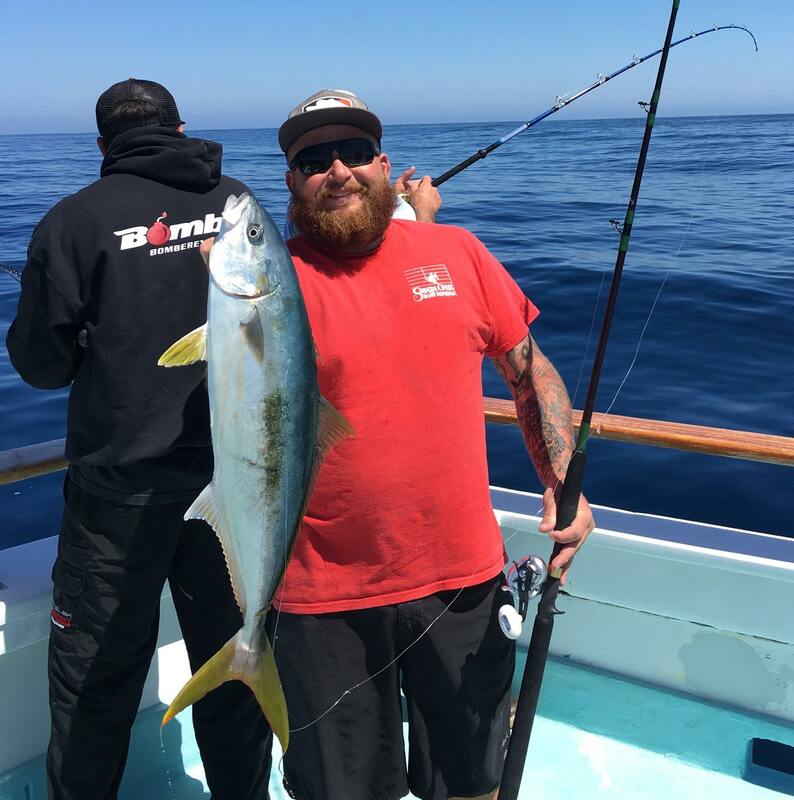 You may wonder if it is worth it, but yes catching the California yellowtail on a party boat is worth it. These fish can range from 5 to 40 pounds and not only are these members of the jack family good to eat but they are very fun to catch. 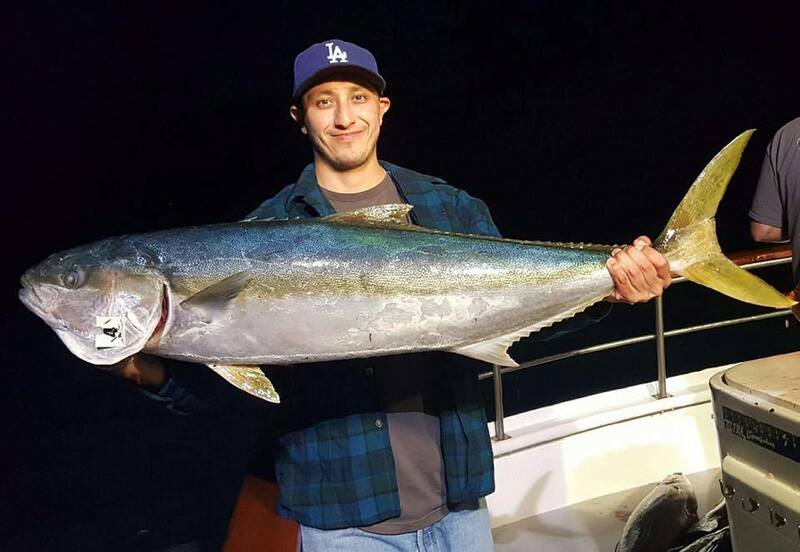 Southern California yellowtail fishing usually begins sometime in March-though this year in San Diego it was earlier and continues to November. 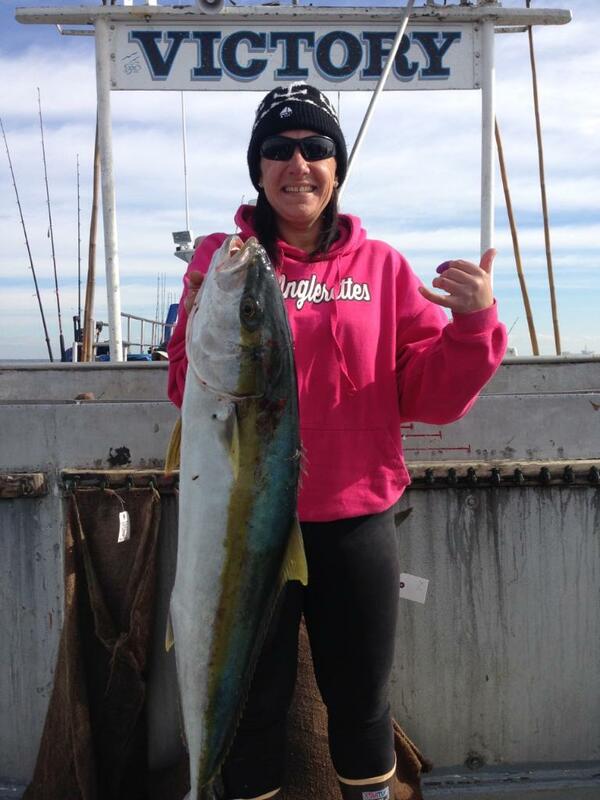 Our local landings sportfishing trips can all catch yellowtail from ½ day trips to overnight and longer trips. Typically, the longer trips have more consistent catches and in greater numbers, but this is not always the case. 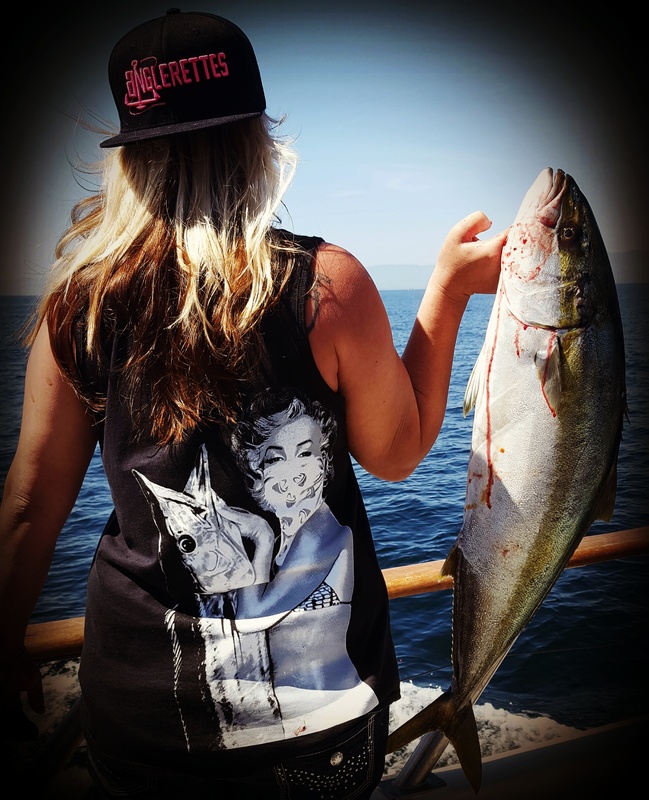 Local yellowtail fishing can be at one of our local islands which is either San Clemente Island or Catalina Island and occasionally Santa Barbara Island. Or it may be paddy hopping. It just depends on where the fish are. Either overnight or ¾ day trips are the best trip lengths to catch spring yellowtail. 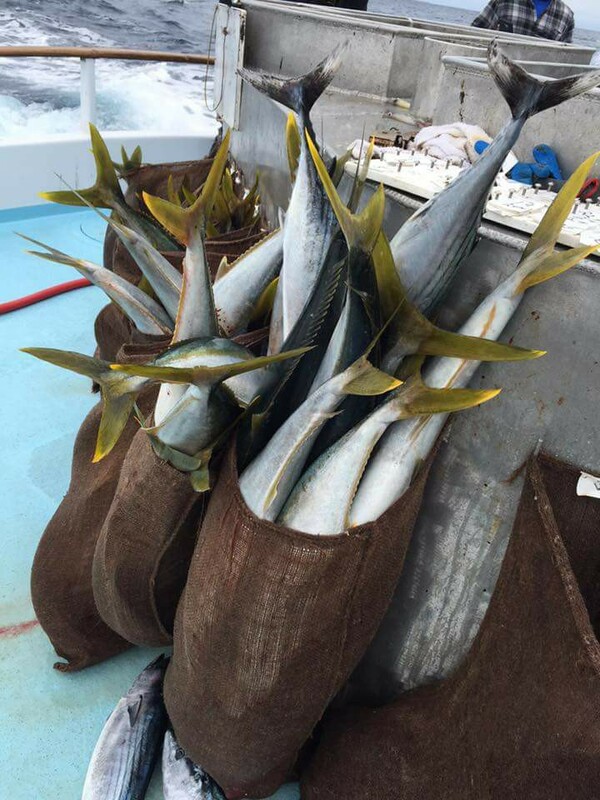 During warmer water years yellowtail will bite fin baits such as sardines, anchovies, and even mackerel. During normal to colder water spring periods live squid may be needed to get the yellowtail in the biting mood. 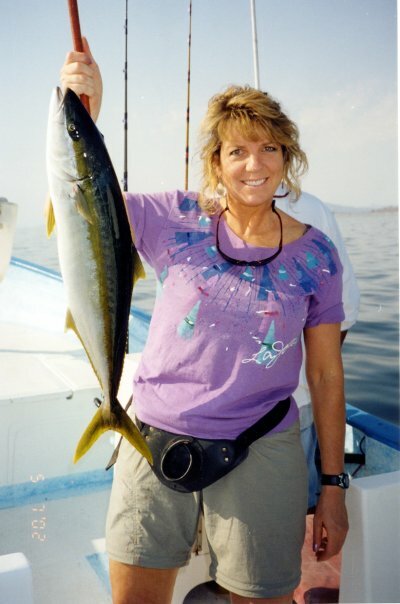 Yo yoing an iron jig can also be effective as well as sight casting to breezing schools of yellowtail on the surface. When fishing with fin baits it is very important to try and select a healthy bait and as carefully as possible hook your bait either in the nose sideways, collar area, or even belly area depending on how you want your bait to swim. Hooking the bait through the nose sideways will cause your bite to swim slightly side wards and at angle to the boat. Hooking it in the collar will also cause the bait to swim sideways as well as slightly downward. Hooking the bait in the belly will cause the bait to swim downward and away from the boat (use when wanting to have your bait go deep). If you are unsure on how you want to present your bait, hook it through the nose sideways as this will be the easiest and best for the longevity of your bait. Once you have cast your fin bait try to let it swim as natural as possible this means letting it take line out and not pulling on it or creating resistance against the bait. If your bait is staying put and not moving much you can give it a twitch to wake it up. If that doesn’t liven your bait, then it is time to change your bait. Change your bait at least every other cast. This is very important as strong bait will get the most bites of yellowtail and almost all other game fish. The only time this doesn’t apply if you have limited bait or a limited type of bait in which case try to make the most of each bait. The deckhands will let you know if that is the situation. When fishing live squid techniques change quite a bit. First you can use a live squid for many casts as a yellowtail will be just as likely to hit an almost dead squid as a lively one. In fact there are times when fresh dead squid is preferred to live squid. There are not too many different ways to hook a squid as you want to hook it in the upper cone area away from the head. Ideally hooking it and then bring the hook back again so it is securely attached. Lots of smaller fish will pick at your bait and if it is not securely attached it will be taken off the hook very quickly by the smaller fish. A large hook such as 2/0 -4/0 (Owner and Mustad are good brands) is ideal as yellowtail will not be hook shy like they can be with fin bait. When fishing with live squid be prepared to fish both deep and shallow or close to the surface. Sometimes the bite is right on the bottom and other times it will be in the middle of the water column or on the surface. Keeping an eye on where anglers are getting bit is the key to using the right weight for the given situation. Your live squid should not run too much even if fishing without any weight so if it starts really moving it is a fish. Fishing iron jigs that run deep, medium weighted, and even surface iron can be very effective. One must be very careful though when doing this type of fishing. It just takes one second of not being aware to hook someone in the head. Some boats actually discourage people throwing jigs when the boat is crowded. Safety first. After making sure the coast is clear, cast your jig a good distance from the boat and then letting it sink for varying times allows you to cover different depths and with different angles of retrieves creating different presentations. The key when fishing a jig is to keep it moving. Usually the faster the better. Surface iron maybe the exception as there is times when a slower presentation works. When using an iron jig you can fish along the side and even in the front of the boat and cover a lot more area than by bait fishing. Most of your bites will come while reeling it back and you need just keep reeling as you get bit. The reeling tension and the fish should set the hook. Make sure your hooks are super sharp before you start fishing. When yellowtail are breezing on the surface a surface iron can be really effective and you can cast into the school before they are disturbed by the boat. Finally before coming out on your fishing trip it is always a good idea to give the Landing a call and find out what bait or baits are available as determining the proper gear for your trip may depend on this knowledge. If you are renting gear then you need not worry about this as several styles of gear can be rented which should be fine for all styles of fishing for yellowtail. For live fin bait, two rods are recommended. Anglers should have 15-20 pound test and a very good reel with functioning drag. The second setup should be 25-30 pounds test on a moderate sized reel, once again with a good drag system. Much of your fishing will be done with the lighter set up for the ½ day and ¾ day trips, but when they do bite it can get very active and having the heavier setup will get more fish into the boat during this time. The following is a list of some of the landings between San Diego and Ventura who offer sportfishing boats that you can catch yellowtail on. For more information on the landing nearest you just google them. In San Diego are there is H&M Landing, Fishermen’s Landing, Seaforth, Helgrens, and Pt Loma Sportfishing. In Orange County there is Davey’s Locker and Newport Landing in Newport Beach and Dana Wharf Sportfishing in Dana Point. In the Long Beach area, there is Long Beach Sportfishing and Pierpoint Landing. Marina Sportfishing has closed down but some of the boats went to Pierpoint Landing. A few miles north of Long Beach is 22nd Street Landing in San Pedro. And a little further north of them are Redondo Sportfishing, Marina Del Rey Sportfishing, and much further north there is Hook’s Landing and C.I.S.C.O. in Ventura and Oxnard.